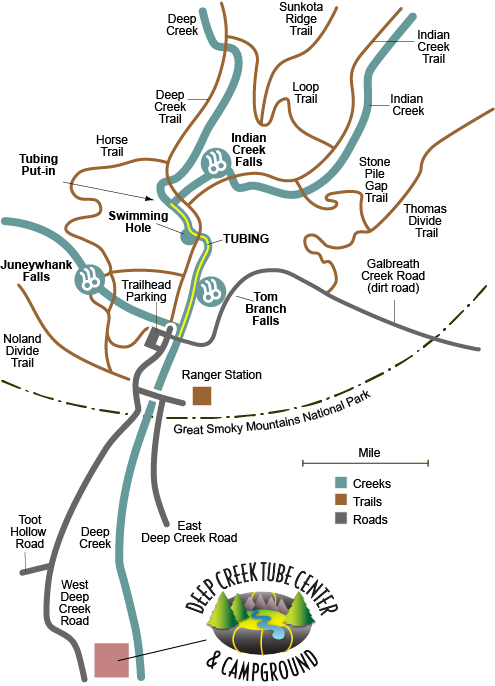 When you vacation at Deep Creek Tube Center and Campground, you're just minutes from the Deep Creek Recreation Area of the Great Smoky Mountains National Park — an area known for fishing, hiking, swimming, whitewater tubing and its three sparkling waterfalls.  Juneywhank Falls — From the Deep Creek trailhead parking area, follow the well-marked trail 1/4 mile uphill to Juneywhank Falls. The roar of the falls can be heard even before you reach it. An eighty-foot cascade of water starts above you and runs under a log footbridge with handrails, and meets up with Deep Creek at the bottom of the trail. Tom Branch Falls — Starting back at the main trailhead, walk just 1,000 feet along the wide, flat Deep Creek trail to Tom Branch Falls, a wispy waterfall that gently splashes over 80 feet into Deep Creek. A bench is provided beside the creek and is a great place to sit and watch the inner-tubers float by. Indian Creek Falls — Continuing along the Deep Creek trail for about one mile, the trail winds up a slight grade to where Indian Creek spills into Deep Creek. Follow the Indian Creek Trail to the right 200 feet uphill to Indian Creek Falls, a high-spirited waterfall that noisily plunges 25 feet to the pool below. A small spur trail leads to the bottom of the falls.